Indian Government provide Post Doctoral Fellowships for Indian Scholars. This scholarship will provide for Research on United States of America. 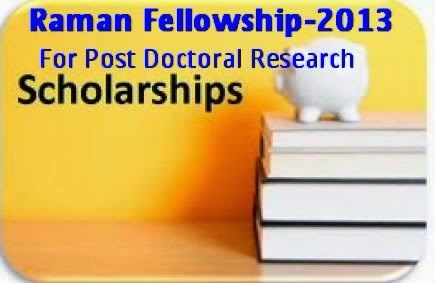 This scholarships named, ‘Raman Fellowships for Post Doctoral Research for Indian Scholars in United State of America’. This scholarship will provided by University Grand Commission (UGC). Online application process for 2013 scholarships started already. • Last Date for Apply Online: 30th June, 2013. This Fellowship will awarded for various subjects. Indian Scholars for the following stream can apply for this scholarship online. The streams are; Humanities, Social Science, Natural Science, Engineering, Technology, Agriculture Science, Medical Science. Recycling of energy and other stream of Energy, Weather changed, Health, Food and some other streams scholars are also eligible for this fellowships programme. Eligibility for this scholarships mention bellow. For apply ‘Raman Fellowships for Post Doctoral Research for Indian Scholars in USA’ applicant’s must passed the Master Degree with 60% marks. Teachers of any UGC recognized University or Colleges can apply for this fellowship. If you want to research on Humanities or Social Science than, P.hd degree must required. Age limit not more than 40 years. Please comment your questions, queries and anything update information about this scholarships. We will always welcome your thought and effort. Apply online for Fulbright Scholarship programme 2013, Click Here to Apply.